>Well, the weekend’s over, I finally have a day off, and there’s so much to write about… and it’s GOOD. What? Oh, I’m sorry. I was distracted. Why does everyone look so much hotter than they did in those stupid team photos from the roster?? 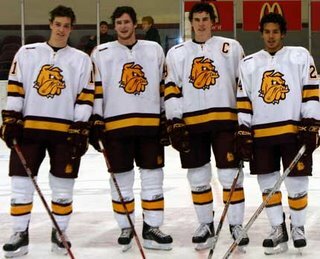 This is posted up on the Camrose Kodiaks website, as all four of these handsome guys are Kodiak alumni. Also, I unearthed my program from last year and discovered that I was wrong. Matt McKnight did actually get a new picture this year, he is just wearing the same thing and has almost exactly the same expression on his face. Chris writes over at Maverick Hockey Nation about starting the season off the right way. The Mavs are a 1-1-0 team, and we are a 1-0-1 team, but it’s all binary. After last year’s October, when we had only one win (the Mike Curry Scoring Extravaganza at Tech), things were looking grim. There’s nothing grim about the start to this season, and it feels great. So, we’re not going to nitpick about the shorthanded goals we gave up (3), but we are going to celebrate the wonderful 7/14 power play awesomeness. Sources say we have a much different power play plan of attack, and DHG will be asking Bruce if that is thanks to Bill Watson. Now I have to think of another question to Ask The Booth. Maybe they should just call it Ask The Bruce. I like that better. The line combinations seem to be working well. Lines 2 and 3 are rolling, and Line 1 is like a freaking scoring bomb just waiting to go off. Line 4 obviously hasn’t been solidified yet, but Saturday (when I actually was able to listen to the game) it sounded like the Gorsalitz-McFarland-Curry line was working well. Goaltending? I’m not concerned. Stalock sounds like he will only get better, he’s already confident enough to play the puck in some tight situations (which almost resulted in a goal for UML, but them’s the breaks). I don’t know what else to say on that note, because Johnson and Ziegelmann only played 1 period of exhibition hockey. We all thought we’d see two goalies last weekend, so any speculation is just… speculation. Final Thought: It totally rocks to see defensemen scoring. The forwards have scored 6 goals, and the defense has scored 4. Whoa, 6 + 4 = 10. 10 goals in one weekend? I love it.